Since mini pigs came to North America from Asia in the 1980s, they’ve become popular pets. National Geographic estimates as many as 1 million pet pigs reside in the United States and Canada. Before you buy a mini pig, learn about the species and make sure you’re ready to make a commitment to your new pet. Then, find a reputable breeder or sanctuary and avoid unscrupulous backyard breeders. Before you shop for a mini pig, become familiar with the names breeders use to sell them. The term mini pig refers to the pot-bellied pig, which is much smaller than the pigs you’ll see on a farm. A full-grown, 3-year-old pot-bellied pig may be as small as 60 pounds or as large as 175. She’ll range from 13 to 26 inches tall at the shoulder. A 175-pound mini pig is much smaller than her farm cousin, who can reach 800 pounds. Some breeders advertise pigs using names such as micro mini pig or teacup pig. 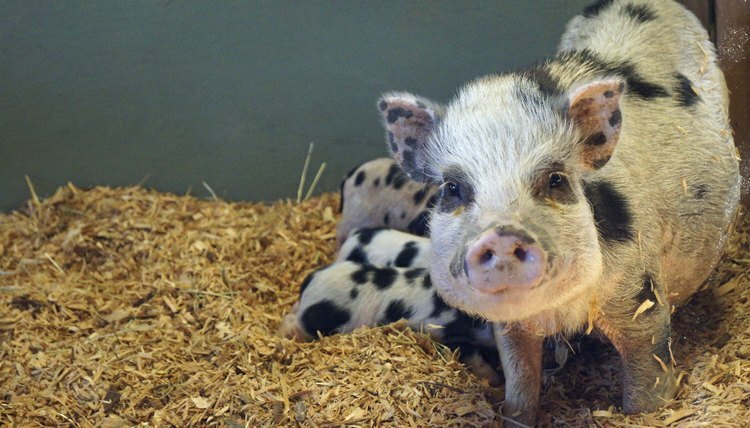 These pigs may look tiny as piglets, but they may grow to at least 60 pounds. Unscrupulous sellers try to keep pigs small by inbreeding and underfeeding their pigs, resulting in weak, sick animals. Others will sell farm piglets and claim that they’re adult pigs. Unfortunately, these little piglets grow up to be huge. Sometimes their owners don’t have room for them. Mini pigs, like any pet, require time and money. Your new piglet will need food, bedding, bowls, a litter box, harness and leash. You’ll need to take her to a veterinarian adept at handling mini pigs. She’ll need vaccinations and regular trimming of tusks and hooves. She will need to be spayed, as well. Your mini pig will live 12 to 15 years. She'll need training, socialization and lots of attention to avoid getting bored or depressed. Sanctuaries and rescues across the country have hundreds of mini pigs who were abandoned when their owners could no longer care for them. Make sure you're ready to make a long-term commitment to a mini pig before you start shopping. Some municipalities do not allow farm animals. Check your local zoning laws to ensure that you can own a pet pig legally in your town. Breeders should offer pigs a high-quality commercial chow specific to their breed at least twice a day, along with supplemental vegetables. Nutrition and adequate feeding ensure that mini pigs grow to a healthy size. Buying a pig from a breeder may be more expensive than getting one from an ad. Remember that you’re working with a person who raises pigs for a living. You’re paying for veterinary care, socialization and quality food. Unfortunately, many mini pig owners find that they are unable to care for their pig. Luckily, many sanctuaries and rescues across the country take in pet pigs and offer them for adoption. The American Sanctuary Association offers a list of accredited sanctuaries by species. Consider a mature pig rather than a piglet. When you adopt a mature pig, there’s no question about how large he’ll grow. You’ll be able to interact with him and see his personality. Pigs have been spayed or neutered and have received other veterinary care. North American Potbellied Pig Association: What is a Micro-Mini Pig?